The AccuTrak® VPE Plus Kit is designed for technicians looking to take full advantage of all the VPE’s many capabilities. The VPE Plus Kit includes everything in our Standard Kit – PLUS a convenient Belt Pack and our powerful Burst Tone Sound Generator! The sophisticated Burst Tone can artificially pressurize any vessel or space with ultrasonic sound, allowing a technician to quickly scan for leaks even where there is no actual pressure differential! The VPE Plus Kit is ideal for technicians who test refrigerator door and window seals, or any other non-pressurized seal or vessel. The VPE Plus Kit is also great for Energy Audits and Surveys, and finding air leaks and sources of air infiltration in homes, aircraft, ships, and buildings.. 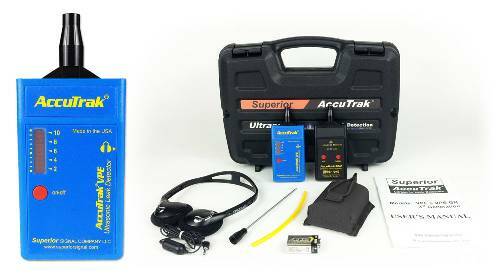 The Patented Superior AccuTrak® VPE is a state-of-the-art non-invasive leak detector that can detect both pressure and vacuum leaks of ANY GAS. The AccuTrak® VPE is ideal for pinpointing leaks in air conditioning, refrigeration, automotive and other systems. AccuTrak® is extremely sensitive to the ultrasonic sound of a turbulent gas leak. Using a technology called "heterodyning" it translates the sound to a lower frequency which your ear can interpret. AccuTrak maintains the original sound characteristics making it possible to distinguish leaks from other competing background sounds. AccuTrak is so sensitive you can actually hear the blink of an eye, yet most background noise will not interfere with detection accuracy. 20% Greater Sensitivity – our all-new 3rd Generation digital circuitry is clearer and quieter, allowing you to detect smaller leaks and faults faster than ever before. The VPE already had the best sensitivity in the industry – and now it’s even better. Peak Hold Display – the new Peak Hold function on the display allows you to find leaks and faults faster and better, so you get the job done quicker and easier. This great feature can be found on instruments costing several times more – but it is unique for this class of instrument. Over Range Audio Alarm – this unique new feature allows you to keep your eyes on what you are measuring rather than on your instrument display, and still know that you have exceeded the range setting and need to adjust the sensitivity for optimum performance. Again, this gets your job done quicker, easier, and safer. Improved Battery Life – up to 200 hours of operation on a single standard 9-Volt battery. More Rugged Design – internal components have been redesigned to make the instrument more shock resistant, resulting in an even more reliable design.